It is the annual mushroom extravaganza put on by the The New Jersey Mycological Association at the Frelinghuysen Arboretum in Morristown, New Jersey. It fills the very large meeting room / auditorium upstairs, and spills over into the two classrooms downstairs. There's an exhibit of a forest floor, complete with neatly labeled mushrooms. Yarns dyed with mushrooms. A microscope for viewing mushroom details. A major display is devoted to mushroom identification. Bring one or several mushrooms you have found and knowledgeable members will do the research using detailed keys and guidebooks to identify them for you. Usually sometime in October, this year the event is on the day after Halloween. Leading to some interesting displays as a result. 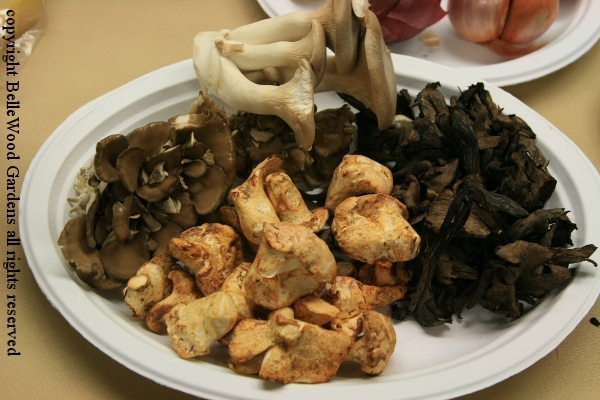 You can hunt for mushrooms for curiosity, perhaps interested in their diversity. It is vital to ascertain their edibility when foraging as a pot hunter. 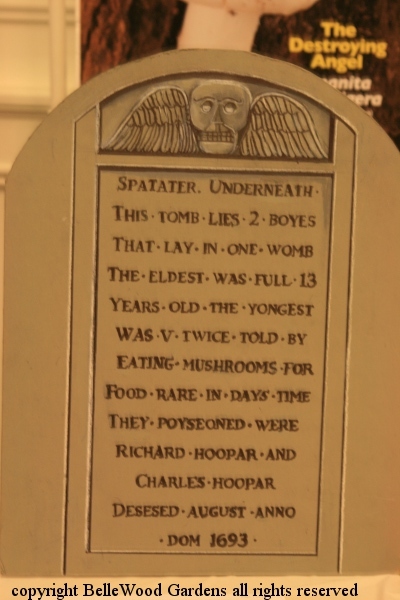 This replica of an actual tombstone from way back in 1693 gives the sad results otherwise. And there are still more mushrooms to use, cooking away the day. 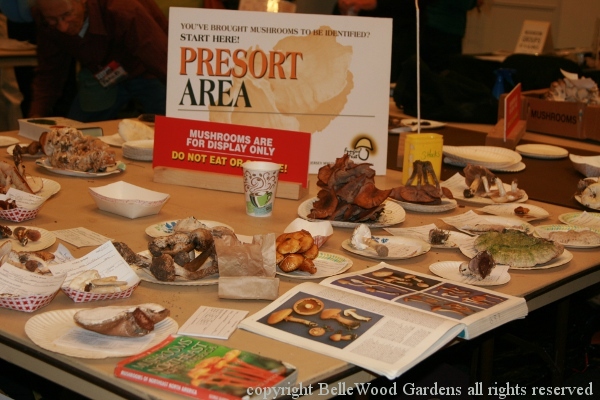 If the Fungus Fest has caught your attention, do think about joining. Modest dues, and in return you receive a great on-line newsletter, notice of forays here and there around the great Garden State of New Jersey, and special members only events. Most of the time I find one outing / day is sufficient. I mean, visiting two or even three gardens in one day is still one outing. After all, they're gardens, right? 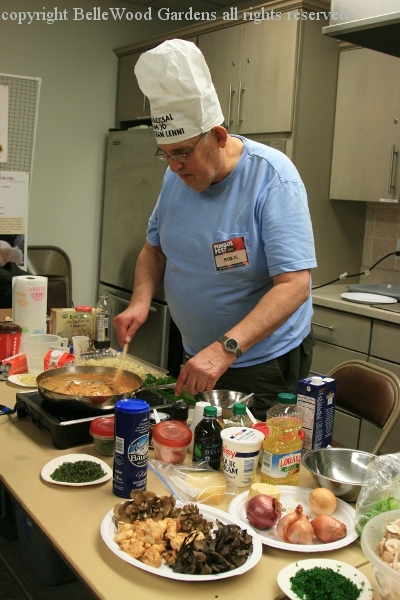 But difficulty arises when a couple of different organizations schedule events on the same day. 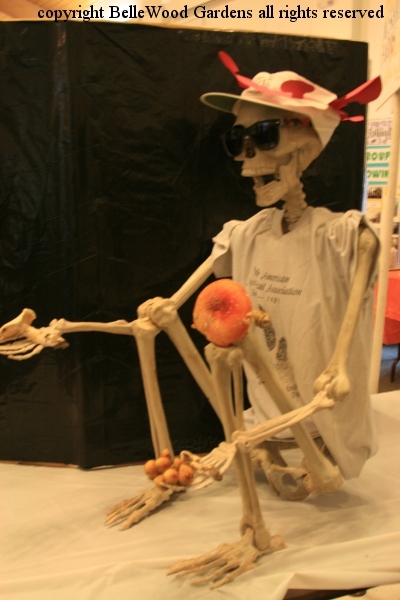 Today, for example, the Fungus Fest is a day-long happening. 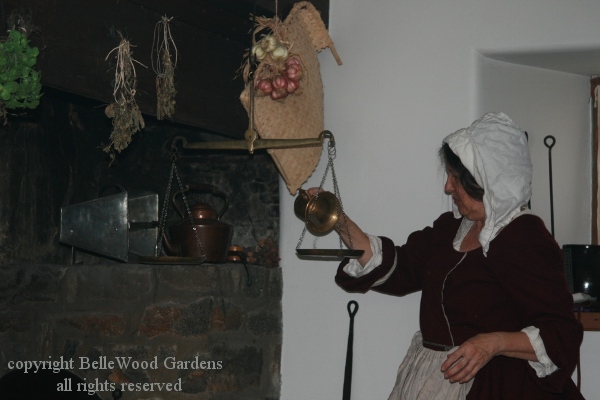 And the Bouman Stickney Museum is having one of their Open Hearth cooking demonstrations in the afternoon. I can manage this, if I keep my eye on the time and leave the mushrooms at 12:30 p.m. Which I did. Only to look at the clock in my car as I head down the highway . . . . Whoops! In the wee hours of this morning we reverted back to standard time. Only the Frelinghuysen never reset their clocks. I'm an hour early. What to do, what to do . . . I know! I'll make an inbetween stop at the Leonard J. Buck Garden! 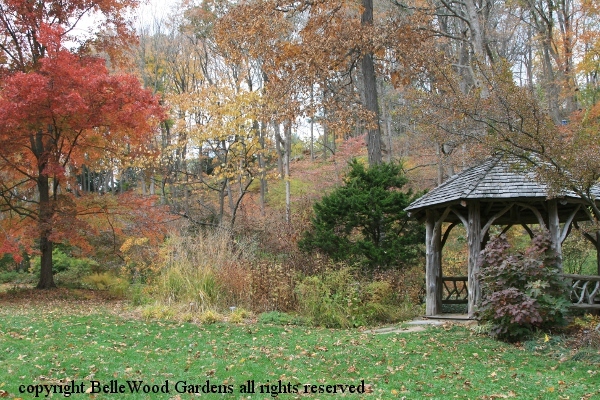 The Leonard J. Buck Garden in Far Hills, New Jersey is a wonderful place to visit in the Spring, when the rock garden plants are at their peak. Summer is also a fine time, with lush greenery. But autumn, ah now, autumn is a delightful time, with even more color from the vibrant autumn foliage than a display filled with flowers. 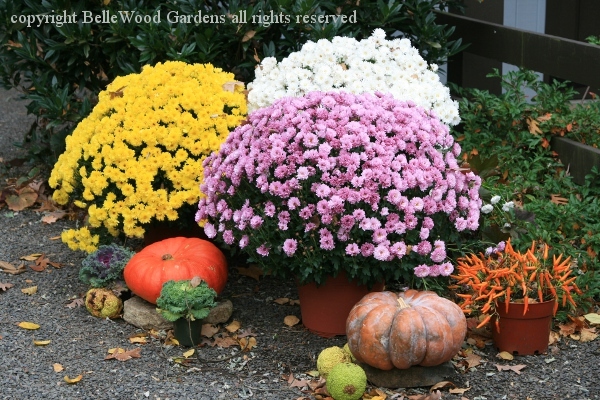 A welcoming display outside the visitors center, with pots filed with chrysanthemums, pumpkins, a pot of vivid chile peppers, and a few wrinkle-y green Osage orange fruits. 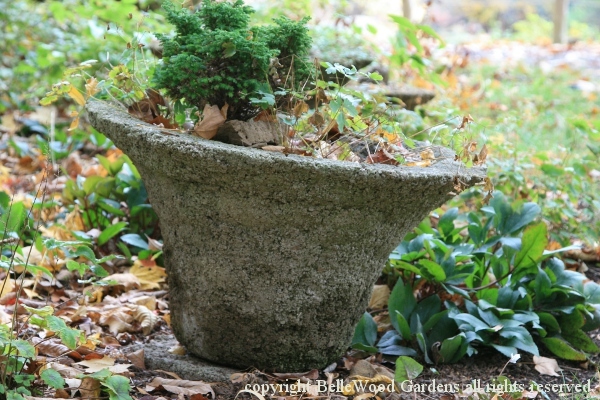 There are a number of hypertufa troughs throughout the garden. Most are the familiar square or rectangular shape, based on the original stone watering troughs in English farmyards. Hypertufa, though (a blend of cement, peat moss, and perlite) is malleable, easily given more interesting shapes. This vortex of a pot is alongside one of the upper paths. 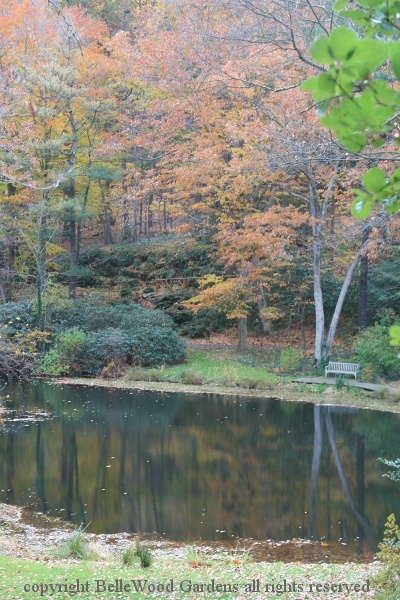 It brings me to the Moggy Hollow Overlook, where I enjoy a view of the still water's mirror and its reflection of autumn foliage and ghostly gray tree trunks. 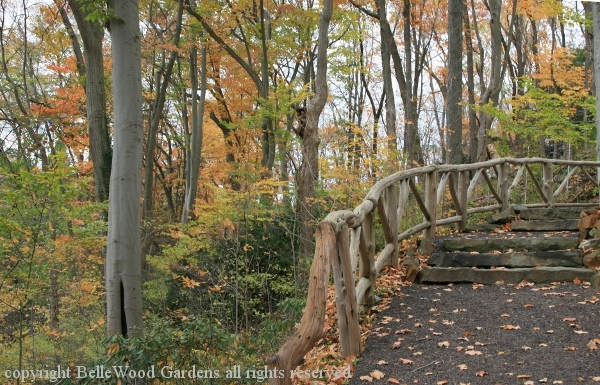 an Adirondack style handrail for safety, security, and attractive good looks. 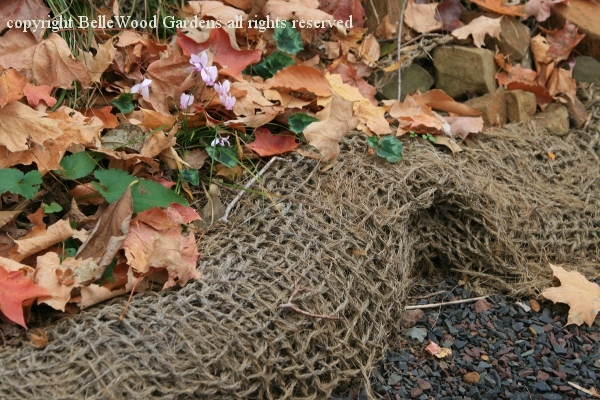 to filter runoff and protect against erosion. 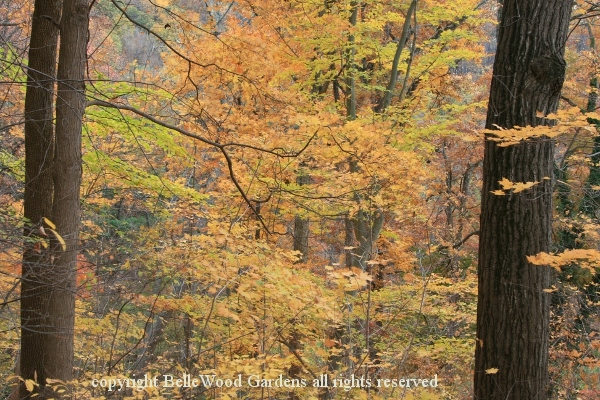 Not bird's eye view, let's say squirrel height look at the changing foliage. Down the other end of the path, to a sweep of lawn and the gazebo. No time to sit and contemplate, must be off to my next destination. 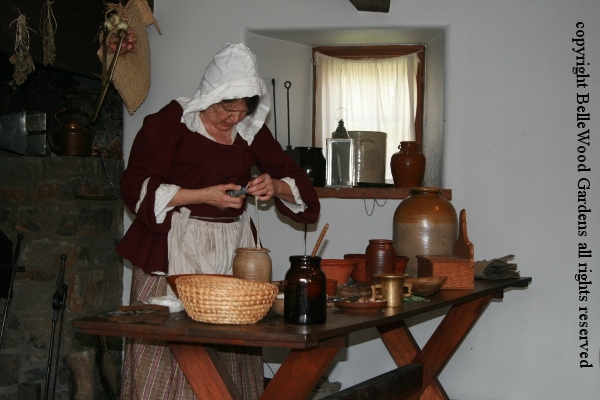 Occasionally the Bouman-Stickney Museum in Readington Township, New Jersey has open hearth cooking demonstrations where a presenter demonstrates period techniques of using a hearth big enough to walk into to prepare some food. 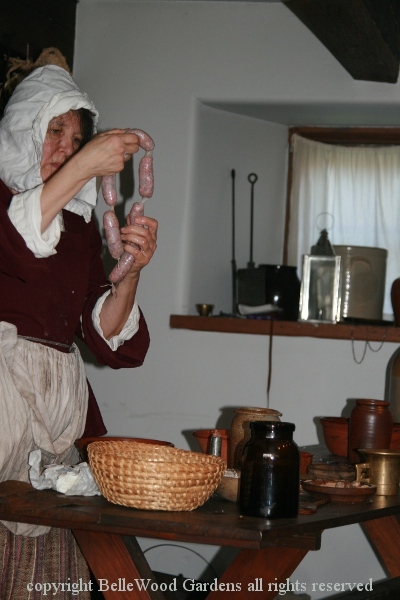 This afternoon, it's sausage making. No convenient little jars of spices. The costly black peppercorns must be cracked fine in a mortar and pestle, then weighed on a balance scale to adjust the quantity needed for the receipt. I can buy sausage casings at the meat department of a supermarket, conveniently (that word again!) cleaned and packed in salt in a small tub. In the day, the casings would come from the intestine of the slaughtered hog, to be scraped and cleaned inside and out. I run water through my dry, salted casings to open them. Here, they may be puffed open with a breath, and again, and again. Think of blowing up a balloon. The casing is carefully worked up of the stem of the funnel. The forcemeat, finely chopped / shredded pork and pork fat, seasoned with the peppercorns, sage, and other herbs, is pushed into the funnel and down into the casing. Once stuffed, the casing is twisted into links. If eaten fresh, within a few days, the sausages are put into a crock and covered with a brine "strong enough to float a fresh egg." Why a fresh egg? Because old eggs have a tendency to lift off the bottom of the crock and even if they do not float to the top the brine will be too weak to keep them. For sausages to be kept for a longer time they would be smoked. An interesting day with three completely different events. But hectic.